Chase Sullivan, 8, presents Sir Elton John with flowers at Monday's ceremony held at Sanders Theatre. His musical genius has earned him millions of fans, five Grammy Awards, and an Oscar. His fashion sense has inspired countless runways and pop singer imitators. 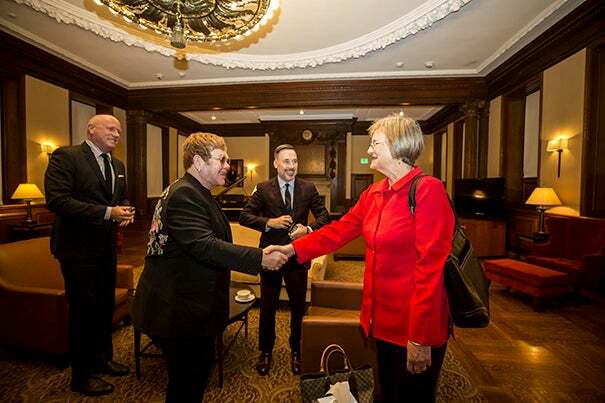 But on Monday it was Sir Elton John’s devotion to charitable work that earned him one of Harvard’s major honors. The singer, songwriter, and philanthropist received the Harvard Foundation’s Peter J. Gomes Humanitarian Award during an afternoon ceremony at Sanders Theatre that included a performance by the Kuumba Singers of Harvard College, four standing ovations, and a heartfelt speech by the guest of honor about the transformative power of kindness. “I’ve seen the power of the human spirit translated into compassion and extraordinary global progress. This has been the most important lesson of my life. Nothing is more profound or more powerful than recognizing our common humanity,” said John during his remarks. John was honored for his philanthropic work on a range of causes, above all his longtime efforts “to fund and raise awareness about the prevention and treatment of HIV/AIDS and to advocate for the rights of all people affected by the AIDS epidemic,” said Rakesh Khurana, Danoff Dean of Harvard College, who introduced the ceremony and awarded John the honor. In 1992, John founded the Elton John AIDS Foundation, whose mission is to end the AIDS epidemic. Since then, the foundation has raised more than $385 million to support HIV/AIDS-related programming around the world. In recognition of that work, John received the Harvard School of Public Health’s AIDS Initiative Leadership Award in 2013. He received a knighthood for his philanthropy in 1998 from Britain’s Queen Elizabeth II. John’s remarks were uplifting, and his outfit, as usual, was joyful. The back of his dark suit jacket was embroidered with colorful flowers, and his black shoes were embellished with a stripe of bright red. John’s musical career has spanned nearly five decades and includes 38 gold and 31 platinum albums. He ranks as the third-most-successful artist in the history of the American music charts. John first made a splash in the 1970s with a string of successful songs and albums and a concert reputation for wild outfits and elaborate stage productions. In 1994, his “Can You Feel the Love Tonight” won the Academy Award for best original song. Three years later, “Candle in the Wind 1997,” his ode to Diana, Princess of Wales, became the best-selling single in history. In 2000, John won a Tony Award for best original score for “Aida,” a musical based on the opera of the same name. John said meeting Ryan White, the American teenager who was infected with HIV/AIDS in a blood transfusion and became a national symbol for the struggle against the disease in the 1980s, changed his life. Watching how White and his family handled adversity and the discrimination they faced “inspired me to turn my own life around,” said John. “Ryan was the spark that helped me recover from my addictions and led to me to start the Elton John AIDS Foundation. John acknowledged that challenges remain, including funding programs to cure HIV that are now under threat, and ensuring healthcare for the poorest and most vulnerable. He also bemoaned the increased incidence of racial injustice and violence against transgender people. “I promise you, we can rise above it and lift people up. We can pull together, we can change the world. It all starts with embracing our common humanity. It’s the most powerful force on earth,” said John. He dedicated his award to the people working with organizations on the frontline of the HIV/AIDS epidemic. Kacey Gill, a Harvard College sophomore and co-director of the Humanitarian of the Year program, expressed the dominant sentiment in the hall filled with admirers from the Harvard community and beyond. Henry Rosovsky (left), former Harvard professor and administrator, speaks with former student Jessica Roth at an event celebrating his 90th birthday and decades of service to the University.